I find that drawing geometric patterns have an interesting effect on the perception of the things around. You start noticing patterns and get curious about how to draw them, which grid they are based on, how they can be simplified to a line-by-line drawing, what would be a fun way to color it. This coloring pattern, series of patterns, in fact, is based on something I spotted on a TV Show called “Extant”. It seems to be a woven or wooden box of some kind. This object appeared momentarily in one of the earlier episodes of season 1. It was a very brief moment, I am glad I took a screenshot but I can’t find the exact episode and which second is it on anymore. If you find it please post it in the comment below! 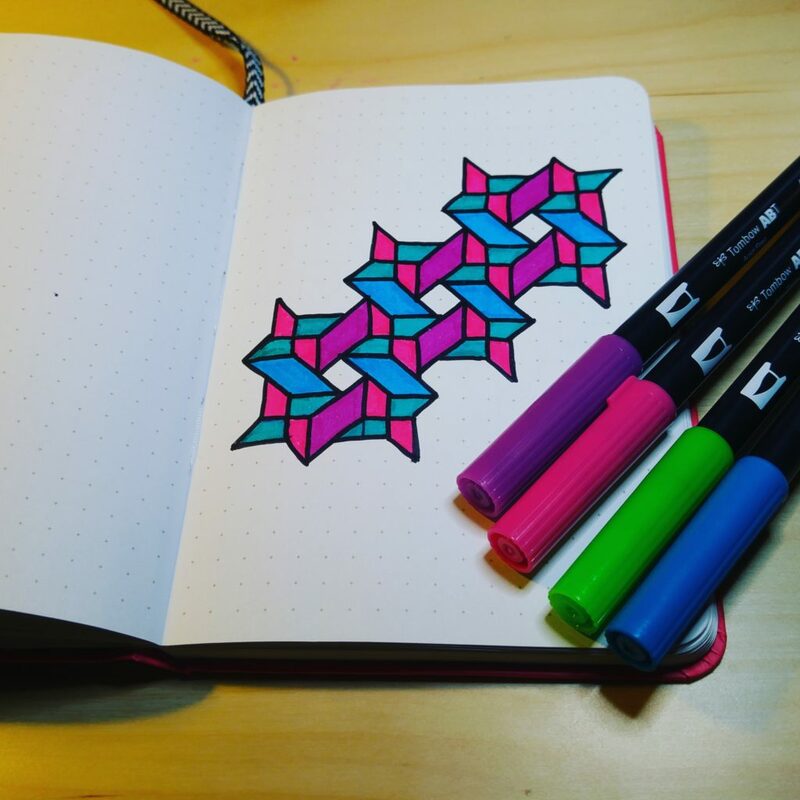 So the coloring patterns below were inspired by the design of this box. It appears to be a square or rhombic grid-based pattern (whichever way you chose to draw it) so I’ve created square dot grid and rhombic dot grid canvas pages as well as a smaller square dot note and rhombic dot note pages that can be downloaded in the downloads section, printed out and used for these patterns. I had quite a fun time exploring this pattern and creating various designs with it and I hope you’ll enjoy them too. To draw this pattern you will need to print out a square dot grid page or use square graph paper. Start with the dot, then draw a vertical and a horizontal line across the dot, like a big plus. Extend the lines from the end of each line of your big plus and finish the basic shape with diagonal lines. 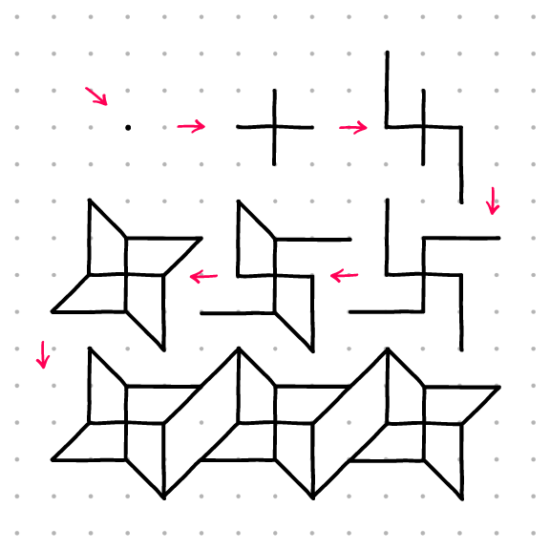 Draw multiple basic shapes and connect them like on the image below. This pattern turned out to be really versatile. Using this method of drawing basic shapes and connecting them you can create all kinds designs. Bellow is the collection of various designs and coloring ideas that I have created over the time I’ve been playing around with this pattern. I just love how a pattern idea led to the whole new world of discovery and creativity. Square and Rhombic grids are what I’ve discovered with the pattern from a woven box I spotted on TV Show “Extant”. See the screenshot a couple of posts before. These are sample drawings of the pattern on square and rhombic doted grid pages. Square dot grid page can be downloaded at https://geomegic.com/downloads/ Rhombic grid is coming right up! The object appears in one of the episodes of Season 1 when Ethan and John were held at the Yasumoto office while Yasumoto’s people were chasing Molly. I’ve been trying to locate that exact moment to take a better screenshot of the object numerous times to no avail. If you find it, please let me know!